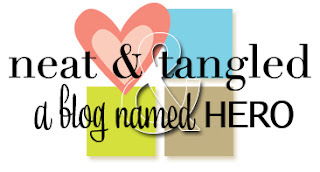 I am so excited to announce that Neat and Tangled will be doing a week long collaboration with our friends over at A Blog Named Hero starting TODAY! Yay! Now be sure to head over to ABNH each day this week to see all of the amazing projects they have for you! I paired up the dotted strip from Neat and Tangled's On the Strip 2 with Hero Arts' Miracle of the Holidays, to finish it off I added a nice old chunky button and some sparkly twine! This was pretty simple and could be easily mass produced for the holidays! There will be projects here and at ABNH each day this week showcasing Neat and Tangled and Hero Arts - they just pair up so nicely! There is a giveaway over on the ABNH blog so be sure to head over! Very simple and pretty Christmas card. Oh super fun...love your clean & crisp card! Love the clean lines. Great card. I love it! Love the clean and simple aspect of it! Your stamping of the sentiment is phenomenal! (That's one of my favorite holiday ones from Hero Arts.) Love this card! simple yet beautiful n joyful. Love the white space....so appropriate for Christmas. Beautiful card. What a great card...and so mass produceable (is that a word?). Fabulous Christmas card! I need to get started, thanks for the inspiration!